The Marlin model 7000 I recently purchased is a fine 22 rifle but I believe that today I purchased the best 22 semi-auto rifle on the market today. 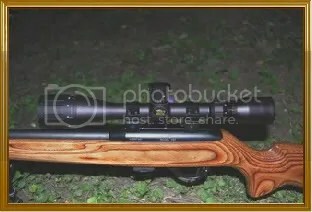 This Remington model 597 with the heavy varmint barrel and a brown laminate stock is not only a beautiful rifle but a very well thought out design. The design lends itself to exceptional accuracy at longer ranges. 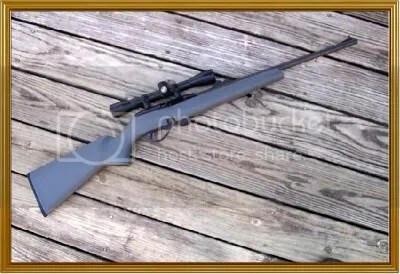 The stock is a common design usually found on larger caliber varmint rifles. The foregrip is wide and provides a nice firm grip with indentations that allow a firm purchase for your fingers. 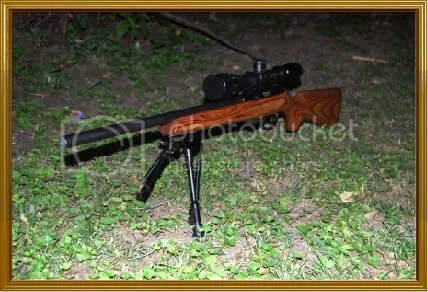 This is one fine stock they equipped this rifle with. The Harris type bipod fits just right and certainly gives you a great stable platform to shoot from. One nice feature is the magazines. Most 22’s have fairly long magazines which honestly can get in the way. The Remington magazine is a staggered type holding ten rounds but is much shorter thanks to the staggered column. The bottom of the mag only protrudes 3/4 of an inch below the stock and has a polymer bottom so you won’t cut your hand on it. The mag release is just behind the magazine and releases the mag using a flat slide that moves to the rear dropping the mag free without having to pull it out. The mag release is visible in this photo just to the rear of the mag. You can also see how little of the mag shows below the stock. One thing I believe adds to the inherent accuracy of this rifle is the manner the internal slide/bolt is engineered. Most 22 bolts simply ride inside the frame without any support to speak of. The Remington 597 uses dual steel rods that the slide/bolt rides on making the action very smooth. In fact it’s the smoothest action I’ve ever felt on a semi auto. The rifle also has a last round hold open for fast magazine changes. When it locks open just drop the magazine and slap another in then pull the charging handle to the rear a short distance and release it chambering the first round. While somewhat heavier than most 22 rifles the balance is very good which is certainly a plus with the heavier target type stock and heavy barrel. The trigger feel is very good as well. This has to do with the hammer, sear and trigger being coated in Teflon making these moving parts very smooth as they contact each other. The trigger pull is very good at just under 4 pounds. Remington has really hit a home run on this rifle. It also comes in 22 mag and 17HMR. The magazine holds 10 rounds in 22, 9 in 22 mag and I believe 9 in 17HMR as well. Also the barrel on this target/Varmint model has a free float barrel for increased accuracy. Over the next few days I’ll make some additional trips to the range and post some accuracy figures with various types of ammunition. Another important consideration for a target/varmint rifle is the choice of scope. I purchased an inexpensive scope this time. It’s a BSA Sweet series 22 in 3x9x 40. I paid $90 for this one which is a pretty good deal since retail is $129. 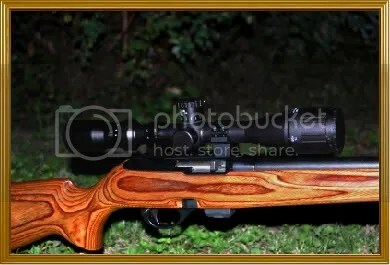 This scope is specifically made for the 22 caliber rifle. It comes with extra turrets for 36, 38 and 40 grain bullets. Once calibrated the turrets are set to zero with a maximum range of 175 yards. On the right side of the scope is the windage knob. It also has graduated markings on the knob for adjustment to the right or left depending on wind speed initial sight in etc. The top turret is very simple to change for the bullet weight you are using. With the 38 grain bullet for instance you simply loosen three screws on the rim and remove this turret and replace it with the proper bullet weight turret. No range adjustment should be required when changing the turrets out for different bullets. From that point on you simply estimate the range and dial it in on the top turret and you should be on target. 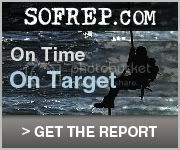 One way to help estimate range is the front focus ring. 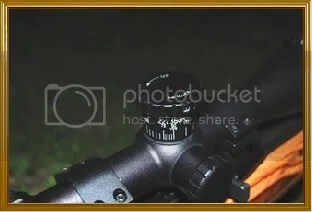 When the target is in focus it gives you the range on the front focus ring. Initial setup takes a bit of time but it’s well worth the time to set things up correctly. A Nikon it’s not but it’s a fine scope for the price. 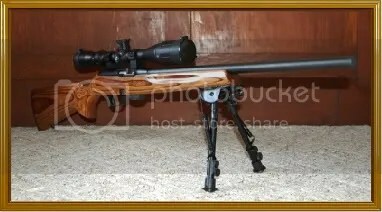 This particular rifle is new but had a small handling scratch on one side of the stock which reduced the price to $225 which is great considering the retail price is $381. The Harris type bipod is made by Rock Mount for sale at WalMart. While Harris bi-pods are in the $65 to almost $100 range I opted for the Rock Mount at $41. It looks identical to the Harris and is made just as well in my opinion. This is my third bi-pod in this brand and they have held up on my AR15’s as well as the Springfield M1A in 308. 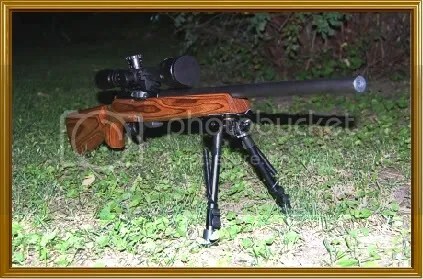 I would recommend this bi-pod over the Harris unless you just want the Harris name on it. Whether you buy this rifle for hunting small game, plinking or varmint hunting at longer ranges you can’t go wrong with this rifle. Most 22 rifles are just functional tools. What sets this one apart from the crowd is the beauty of it as well as the design features and accuracy. This is going to be my very favorite 22 semi-auto I can be sure of that already. The only 22 rifle that tops it is the Marlin Golden 39A. The 39A was my second rifle back in the early 1960’s so there is a lot of emotional attachment to this rifle. The only problem with it now is price. The last one I saw was just over $700! One last note. The scope does not come with scope rings. It uses standard 1 inch rings. This one I mounted on a set of rings that use a Picatinny type rail even though you can mount them directly to the top of the receiver in the grooves milled into the top. It is pre drilled for adding the Picatinny rail. As always your comments and questions are welcome! 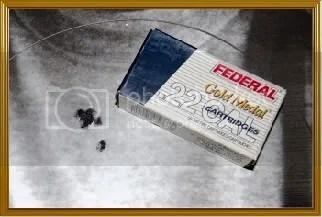 I bought a box of Federal 40 grain match ammo for testing groups at 50 yards. The results were great. The picture below shows how small the group was from 50 yards. Compare the group size by comparison with the 50 round box of match ammo. I did throw one round but all the others of the ten round group are all touching. I was certainly pleased! The learning curve isn’t to bad learning the features of the scope but once mastered it’s a very nice scope!